Alanah is an Oriental Dancer whose elegance, creativity and fiery stage presence have earned her the reputation as one of New York’s most respected dance artists. Alanah has developed, through years of training and performance, a wholly original and emotionally evocative style; modern, fluid and artistic. Her dancing has been described as regal and timeless and transcending trends and stereotypes. 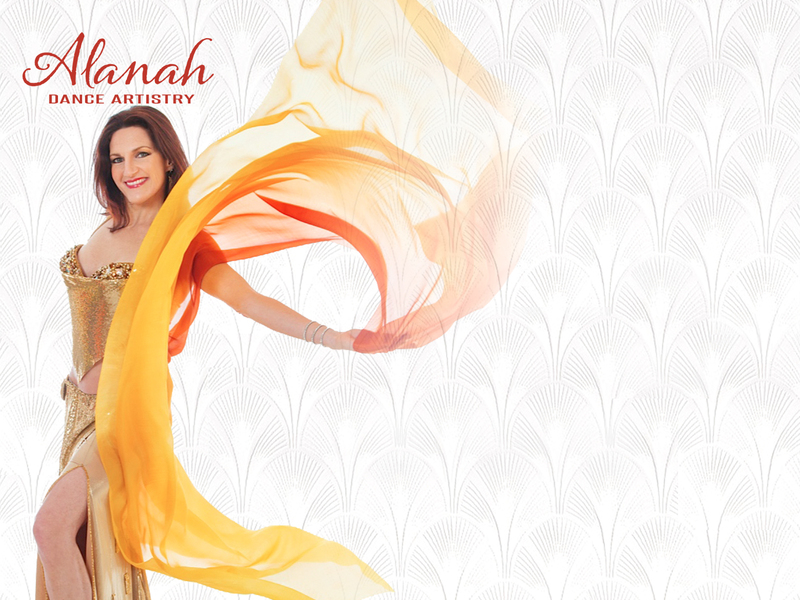 Alanah has performed at numerous theatrical concerts, private engagements and cultural events highlighting Egyptian and fusion-style Oriental Dance and she has been honored to perform at the United Nations. She is a four time award winner at the Bellydance Nationals Competition, recognized for outstanding performances in Contemporary Bellydance and Fan Veil/Fusion dance. In 2010, Alanah joined the World Fusion dance theater company Dalia Carella Dance Collective, led by renowned choreographer and dancer Dalia Carella. Alanah performed in the company’s many theatrical productions including it’s 10 year retrospective at the Dance New Amsterdam Theater in 2011. In 2001 Alanah joined Caravanserai Dance Theater, led by the legendary, contemporary oriental dance choreographer Elena Lentini. The company’s production highlights include “Garden of Abraham”, which was regarded as a “tour de force” by the New York Times and “Argumentum Ornithologicum”. In 2010 Alanah created “Alanah’s Couture Fan Veils,” her successful line of silk dance accessories which are now used by performing artists and theatrical companies around the world. http://www.etsy.com/shop/alanahbellydance/about/ Alanah is also proud to announce her new entrepreneurial project Brooklyn Body Bling; a line of sparkling jewelry in crystals and semi precious stones set to launch in June 2018. Her career as a Middle Eastern dancer began in Santa Fe, NM while a serious flamenco student and full-time painter. Her extensive dance background now includes study with the most renowned artists in the Oriental Dance world, including Yousry Sharif, Dalia Carella, Elena Lentini, Shareen El Safy and Egyptian stars Raqia Hassan, Randa Kamal and Nour. Alanah’s style is also influenced by her years of Flamenco training, most notably with Juana Amaya in Sevilla, Spain. Alanah is a world traveler who continues to explore contemporary developments in her dance while furthering artistic inspiration. Highlights includes travel to Egypt for private study and dance/music festivals. Alanah holds a Bachelor of The Arts degree from the University of Wisconsin-Madison.